doing a lot more hunts so I have decided to just combine my hunts together. March 10-15, 2016. 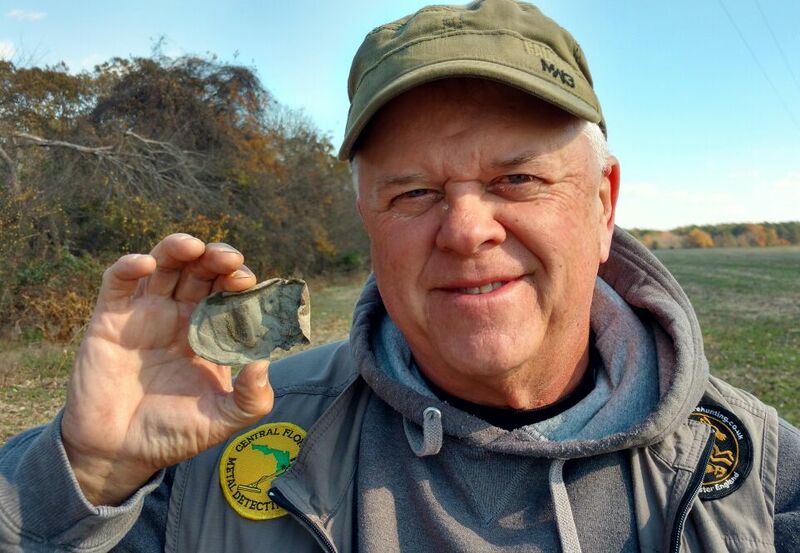 My good friend Ron invited me up to Maryland for our second annual "Digging with MarylandRon" WHAT A HUNT! The picture tells it all. Thanks Ron. 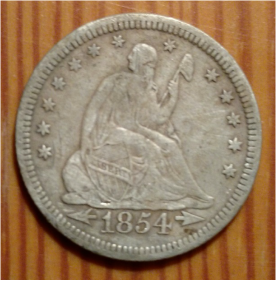 1854 Seated Quarter. My first ever. I also dug my first ever Seated Half Dime a year ago with Ron. 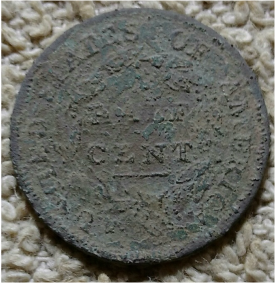 My first ever Half Cent. 1809. I went on a 2 day organized hunt in Pennsylvania near Philadelphia. 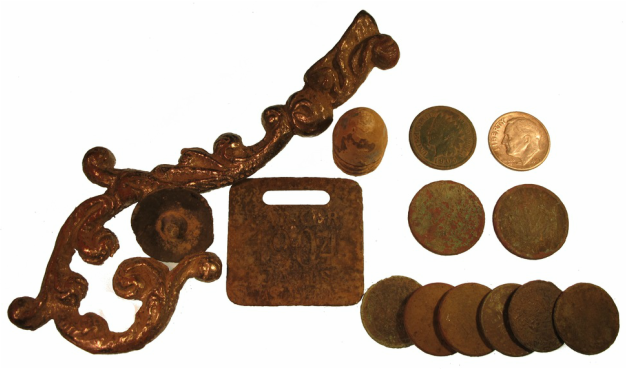 I found a few goodies including a nice 1844 Large cent. 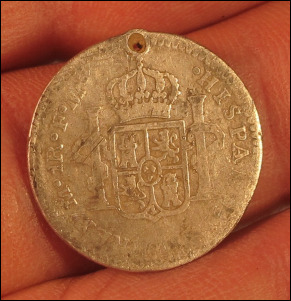 But this Spanish Silver One Reale is so incredible. 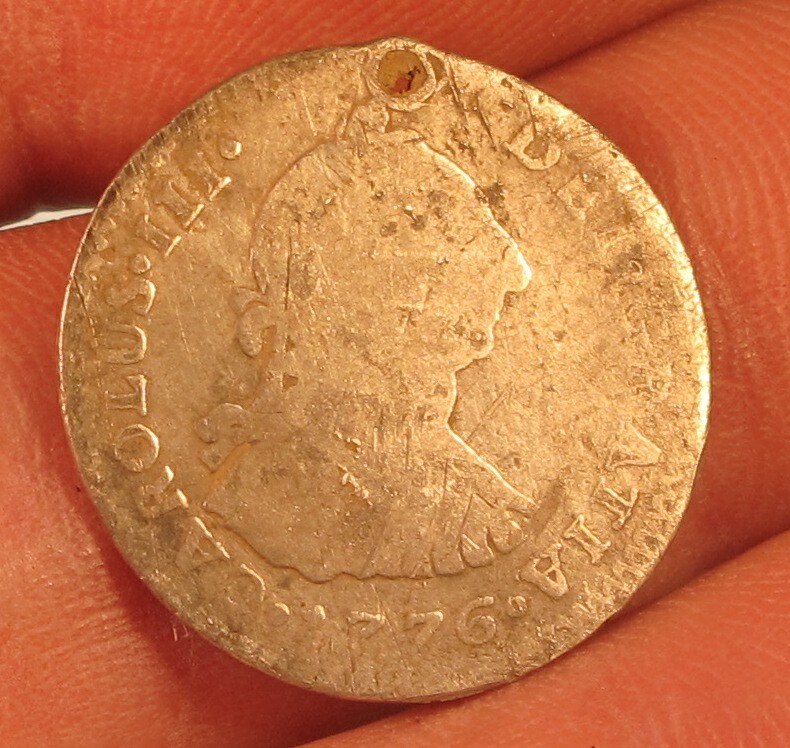 It is always great to find Spanish Silver here in the States but this one is dated 1776 and was recovered right near Philadelphia. How neat is that! Wrap-up. Assorted Civil War items and other relics. 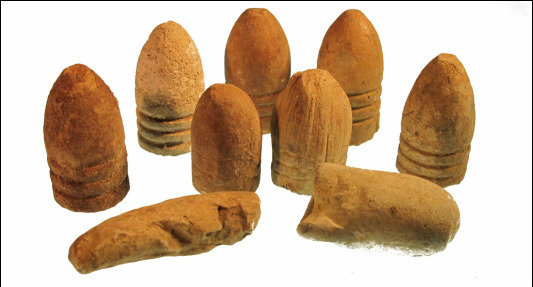 9 assorted Civil War bullets. 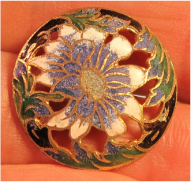 Gorgeous multi-colored enamel button. Ornate design both sides. About the size of a quarter. What a neat find. 1904 Campaign piece. 3 collectibles in 1. Watch Fob, simulated luggage tag and a presidential campaign piece. Gorgeous 1905 Indian Head Penny. 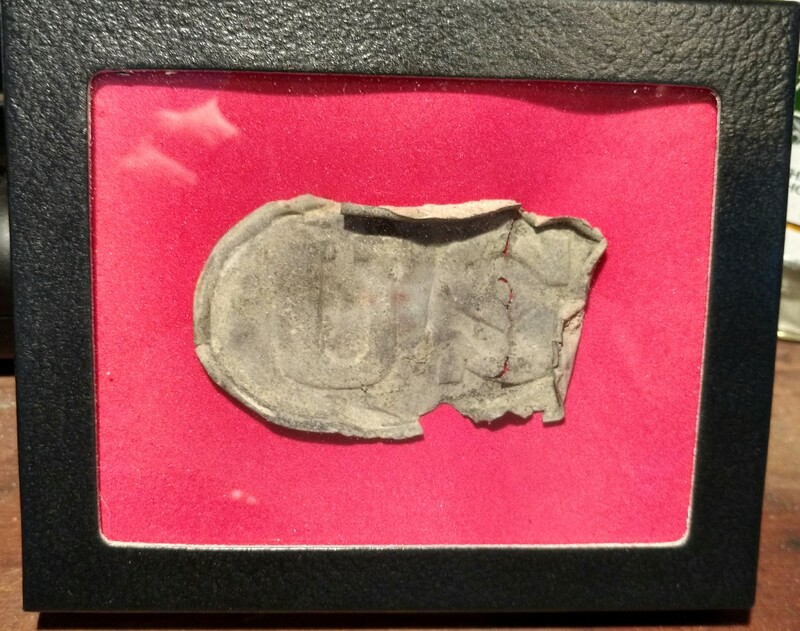 Wrapup including a Buffalo Nickel, a V Nickel, a Minie Ball, and a silver dime. All my keepers from this hunt. Great hunt. What a fun hunt. Great digs for everyone. 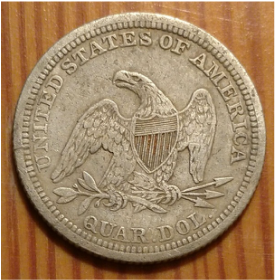 My first US Box plate along with a killer Barber Quarter. 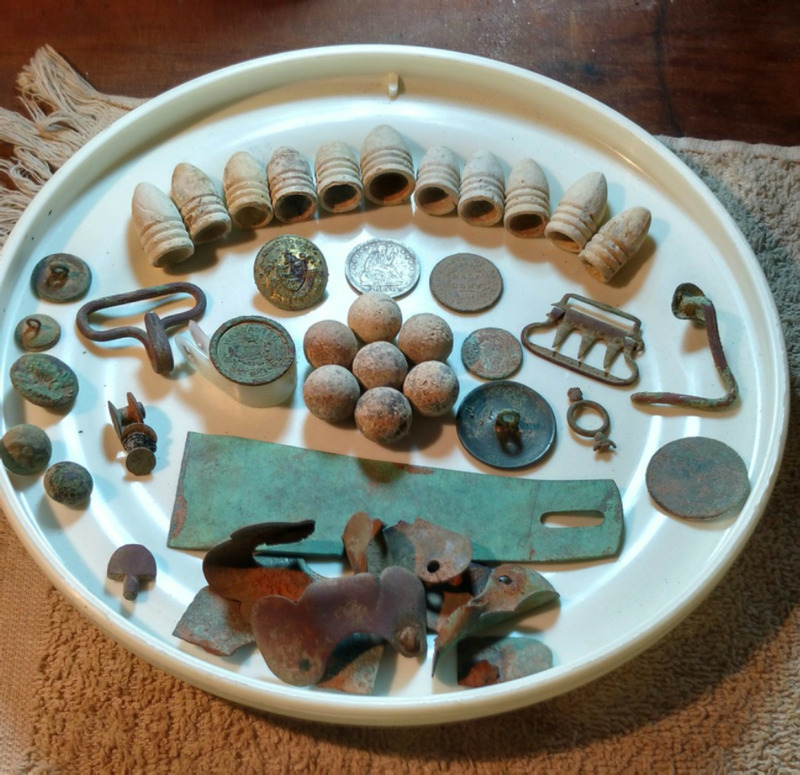 As you can see in the group shot I found the following" 10 CW Bullets, 2 Indian Head Pennies, a V Nickel, a silver thimble, A fuse from a Civil War artillary shell (another great find), assorted buttons,rivits,and buckels. Great team of hunters! From left to right is FloridaJim, PepsiJohn, FloridaDean, FloridaChuck, MarylandScott and FloridaRob. LouisianaSal is not pictured. He is the organizer and guide. Debase silver thimble made in Germany. FloridaJim, PepsiJohn, FloridaDean, FloridaChuck, MarylandScott, FloridaRob. SMILEY FACE. 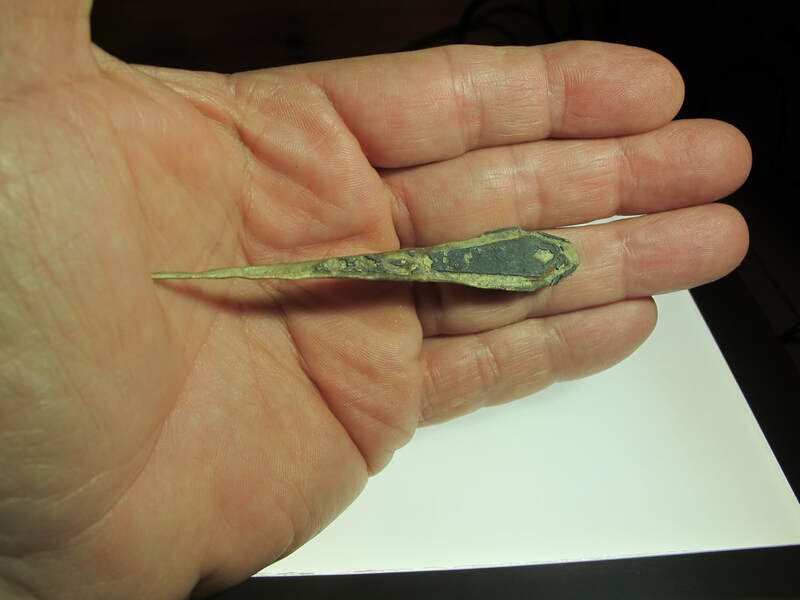 10 Civil War bullet. Always fun to find these. 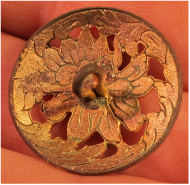 Fuse adapter from a Civil War artillery shell. Great find. 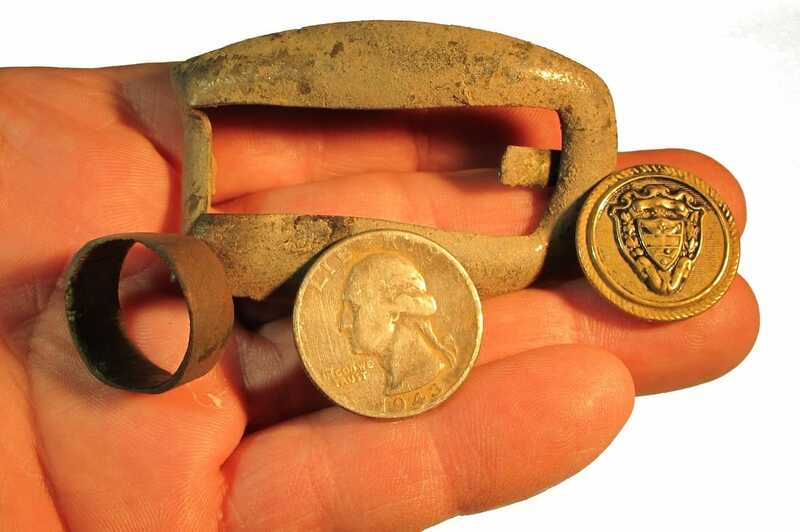 Civil War period toe tap. Click Image for live video....16 Bullets in one hole! My friend Ron invited me up for another relic hunt. 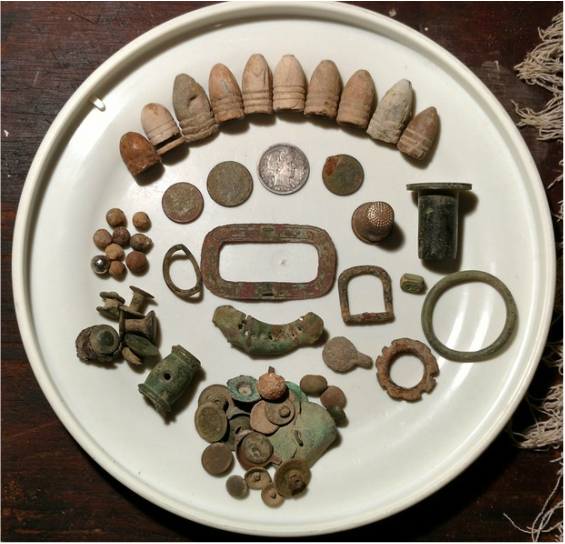 Some flat buttons, harmonica reeds, a lead seal, a vintage brass comb with the teeth missing and my best find...a 6th New York Calvary Regiment number. Vintage Hair Pin. Ron also took me to another location and popped this neat relic. Another really fun hunt as usual. My recoveries are shown below. 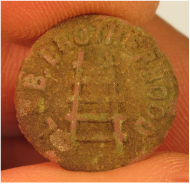 Everyone found some nice stuff with North Carolina Tim popping the best find........a coat size Confederate Calvary Button...A beauty. 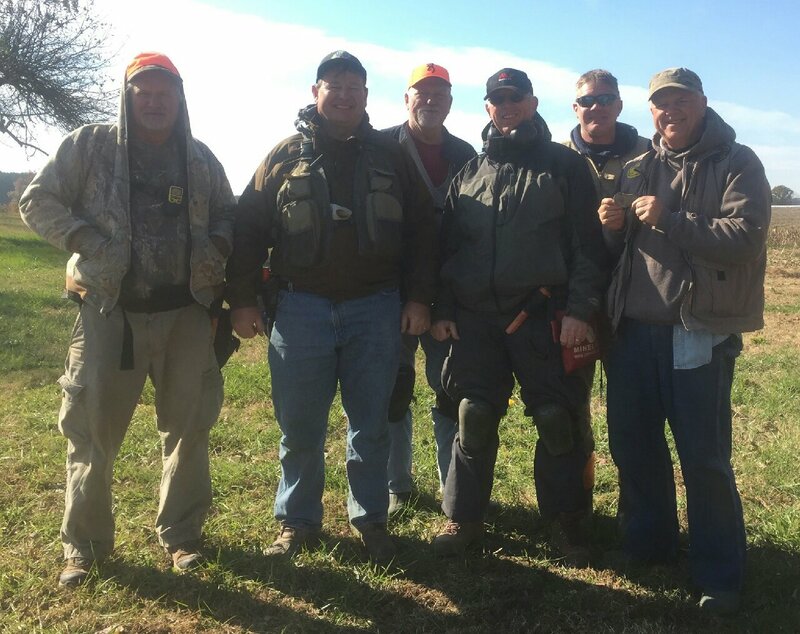 JimmyCrossBones, Sal and Ashley Guttuso (Guides), OhioScott, North Carolina Quinn, North Carolina Tim (Father & son), OhioJerry, FloridaRob, FloridaDean, OhioChris. My pouch. Eight total Civil War bullets (Snow White and the Seven dwarfs), very old pocket knife, harmonica reed, old pennnies including a 1907 Indian Head, 2 railroad spikes, an ID tag of some sort and the disk that looks old but I cannot ID it. Need help on identifying this one. About the size of a half dollar. Please help.